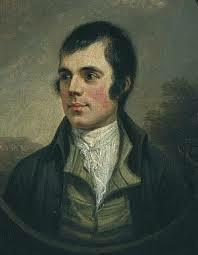 Robert Burns was a Scottish poet. Burns (until 1786 spelled Burnes) was born Alloway, Ayrshire, Scotland on January 25th, 1759, the son of self educated tenet farmer. Much of Burns education came from his self taught father. His father taught them the basics of reading, writing, arithmetic, geography and history. Later Burns would attend an "adventure school", which was a school outside the normal school system of Scotland at the time. At the "adventure school" Burns would learn Latin, French and mathematics. At the age of 15 Burns was already writing poetry. His first piece, O, Once I Lov'd A Bonnie Lass was inspired by a fellow worker, Nelly Kilpatrick, at the farm where the Burns family was living and working at the time. Burns father would struggle until he passed away. Because of this Burns was moved around quite often. When farms where they were tenant farmers would fail, the family would move on to a new community. In 1777 the Burns family moved to a farm just outside Tarbolton. Two years later Burns and his brother, Gilber would join a country dancing school. Shortly after they would form the Tarbolton Bachelor's club, a debate society. Burns had relationships with a variety of women and had several children by many of them. Although he is confirmed to have been married to Jean Armour, a member of The Belles of Mauchline, who he married in 1788, they would have 9 children. It is also believed that he was married to Mary Campbell who died of typhus. It is mostly based on a rumor that the two were married. In 1786 in order to support this family, Burns accepted a job on a Jamaica Plantation. Mary Campbell passed away around this time and Burns did not have the money to travel to Jamaica. A friend suggested that Burns try to sell his poetry. Burns published his first book of poetry Poems, Chiefly in the Scottish dialect also known as the Kilmarnock Edition. It was an instant success. In fact it was so successful that Burns traveled to Edinburgh and would publish the Edinburgh edition of the Poems, Chiefly in the Scottish dialect. In 1895, Burns worldly prospects had never been greater. Unfortunately he had alienated many of his friends with political views. To prove his loyalty to the crown he joined the Royal Dumfries Volunteer, a home defense force during the French Revolution and Napoleonic Wars. His health almost immediately gave way and he began to age prematurely. After a tooth extraction Burns passed away on July 21st, 1796. Burns was initiated at that age of 22 in St. David's Lodge No. 174 in Tarbolton.